Hmmmm, perhaps I agree with you on that one Ruth, but having said that, they're still nice bright layouts and super pics. Liking both of these too, hope it you do start to like it because its very effective. See what you mean about the first one, just looks as if it needs all the parts connecting up somehow iykwim. Second one is lovely summery one. It could be because the yellow isn't in the photo's, but what if you put a flag/banner or two between the pics from the other side (pointing to towards the A), would that bring the two sides together? It's not a bad LO, but I think I know what you mean, no journalling either. I prefer the 2nd but they're both good. I know what Di means about the first one. The second one is fab! 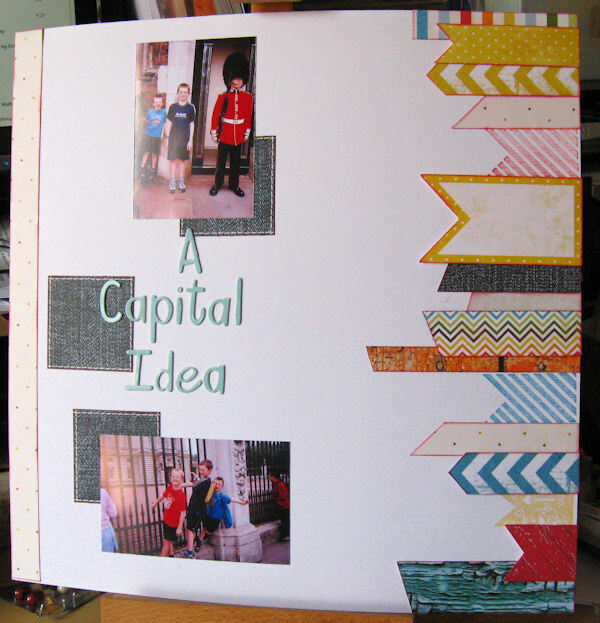 Maybe I should have used more red and less yellow, not a lot of journalling to do unless Mum and Dad can remember when on earth they took the boys to London as it wasn't me.